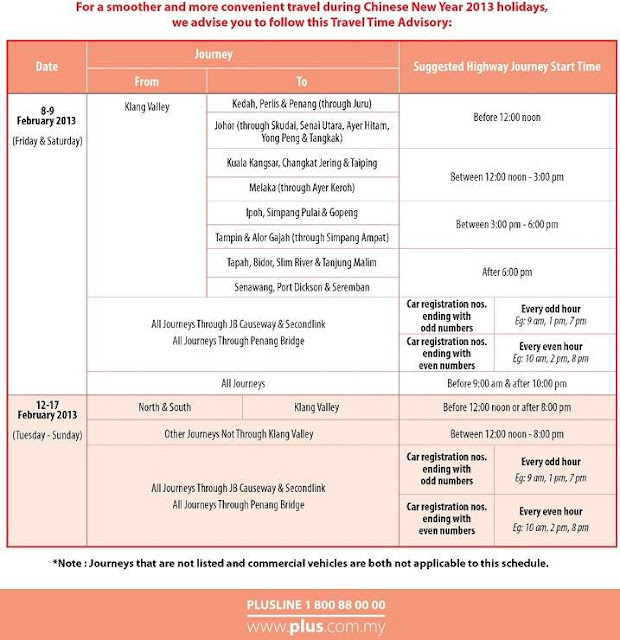 PLUS had published its' Travel Time Advisory (TTA) on North-South Expressway for Chinese New Year 2013 Holidays for smoother traffic flow during peak periods for this coming holiday. The TTA consists of recommended staggered travel times for various destinations from the Klang Valley to major states and cities in Kedah, Perlis, Penang, Perak, Negeri Sembilan, Melaka, Johor and Singapore. It is aimed at distributing traffic and reducing congestion on the mainline, major toll plazas, rest areas and lay-bys during peak periods. Check out also CNY 2013 Toll Rebates for PLUSMiles user. LIKE & SHARE out this PLUS love ya! Gong Xi Fa Cai & drive safe on your journey!